I envision the Tattered Rose Fairy as a bit of a rebel fairy. She is feminine and loves roses and girly tulle gowns, but she also loves late night dancing and whiskey. Her wings are the fairy equivalent of smeared mascara after a long night out. They are weathered and a bit singed. I am certain The Tattered Rose Fairy has at least one tattoo, but most likely many more. 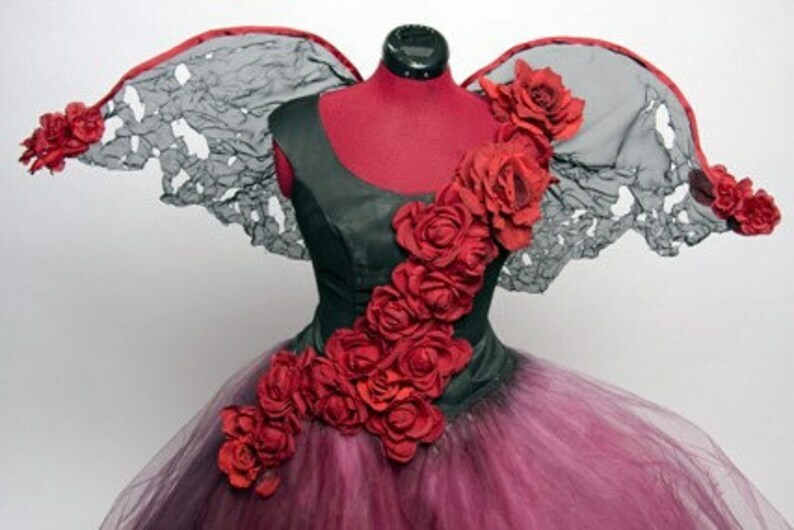 The Tattered Rose Fairy costume features a solid black satin bodice adorned with full deep red roses. The bodice has princess seams and a flattering scoop neck. The skirt is incredibly full tulle that has been painted a dark red and black. The wings are sheer black distressed chiffon and edged with deep red grosgrain ribbon. They feature a clump of roses at the end of each wing. Please note that each dress is a one-of-a-kind creation and the dress pictured is a representation only. *It is very important that you read my store policy regarding fit and returns before purchasing any item from my shop. Due to the nature of a custom-made garment, while generally unnecessary, I still suggest you plan for minor alterations due to my inability to do an in-person fitting. Also be sure to ask any and all questions about my dresses. I am very quick to respond to convos. Thank you!